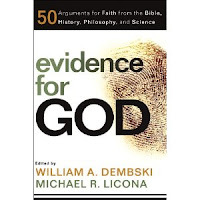 I'm now up to chapter 13 of Dembski & Licona's Evidence for God, which is approximately one-eighth of the way through its "50 Arguments for Faith from the Bible, History, Philosophy, and Science". As I feared, it's proving a tedious affair. Given that this is a recent book I'd hoped it might contain some really good up-to-date arguments, or at least a challenge of some sort. So far, however, it's been disappointing. The first section, The Question of Philosophy, should have been challenging, but seems to comprise what I (a non-philosopher) can only describe as philosophically bankrupt arguments. The current section, The Question of Science, appears to be all over the place; some of its chapters don't offer an argument at all, so I fail to see how they count towards the "50 Arguments". Who's "dreaming up conspiracies and making false accusations" here? I seem to remember a somewhat disreputable film (that's putting it mildly) called Expelled: No Intelligence Allowed that was chock-full of conspiracy theories, every one of which was promptly debunked by people who actually investigated the facts. It sounds entirely reasonable, until the last sentence. In evolutionary science — the kind supported by peer-reviewed research — there isn't a controversy about the subject of evolution. The controversy is entirely in the minds of ID proponents who want biological science to be based on a religious idea.